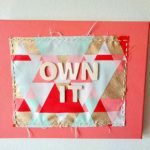 This is part of a week-long series for National Sewing Month. Don’t forget to enter the Grand Prize Giveaway! 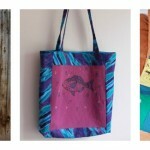 These quick and easy fabric postcards also make great gift tags and ornaments. • Fabric for front of postcard. 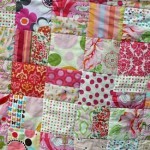 Use assorted scraps, fat eighths or quarter yards in holiday prints, quilt blocks, or remnants of other projects. • Backing fabric. If you plan to send your postcard in the mail, use white or another light color for best results. • Double-sided stiff fusible interfacing (such as Fast2Fuse). • Double-sided paper backed fusible. • Thread in your choice of color for stitching and bobbin. • Rotary cutter, cutting board, and 4” x 8” quilting ruler OR fabric scissors, ruler, and marking pencil. 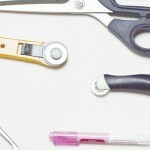 • Basic sewing supplies including seam ripper, pins, small scissor for snipping thread ends, etc. • Embroidery floss and embroidery needle (optional, for embellishment). • Permanent or fabric markers (optional, for embellishment). • Buttons, beads, lace, or other finds (optional, for embellishment). • Cut piece for front of postcard to 4.5” (11.5 cm) x 6.5” (16.5 cm) for each postcard. 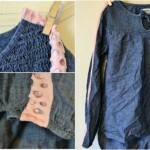 If using scraps, sew pieces together and then trim to desired size. This square scrappy quilt block was trimmed down to size for a fabric postcard. • Cut piece for back of postcard to 5” (13 cm) x 7” (18 cm) for each postcard. • Cut double-sided stiff fusible interfacing to 4” (10 cm) x 6” (15 cm) for each postcard. • Cut double-sided paper backed fusible to 4.5” (11.5 cm) x 6.5” (16.5 cm) for each postcard. • Heat iron on cotton setting (or the highest heat for the fabric you are using) and place Teflon pressing sheet on ironing board. • Create a sandwich for the front of your postcard by placing the stiff interfacing on top of the Teflon sheet and the fabric (right side up) on top of the interfacing. Press firmly down on the fabric with the iron for 30 seconds or as directed by the interfacing package. • Allow the piece to cool and then gently peel away from the Teflon. • Embellish and decorate the top of the postcard as desired. You may want to embroider; use your sewing machine to write, create symbols, or quilt; or add buttons or other embellishments. If using the sewing machine or embroidery floss, choose a light color floss or bobbin thread so that the thread won’t be visible through fabric once the backing is applied. Trim any excess pieces of thread before continuing to the next step. This postcard front was embellished with decorative sewing machine stitches. • Place the paper backed fusible with paper side down on the Teflon pressing sheet. Place the fabric for the back of the postcard (right side up) on top of the fusible. Press firmly down on the fabric with the iron for 30 seconds or as directed by the fusible package. • Allow the piece to cool and then gently peel away from the Teflon. Remove any bits of fusible that are still attached to the Teflon. • Peel off the paper backing of the fusible. • Place front of the postcard facing down onto the Teflon, then the back of the postcard facing right side with the exposed fusible adhesive facing the front piece. Position the pieces to make sure you have your front and back aligned appropriately. Press firmly down on the fabric with the iron for 30 seconds or as directed by the fusible package. • Trim the postcard down to 4” (10 cm) x 6” (15 cm). • To create an ornament, thread your embroidery needle with floss in a similar or lighter color to the thread you will use to seam the edges. Tie a knot at the end of the floss and then insert needle from the back of the postcard to the front from the top corner. Insert the needle from the front to the back on the opposite corner. Adjust length of hanging and then fasten off floss, tying a small knot in the back. • Attach the zig zag foot to your machine. Adjust the zig zag stitch settings on your machine to make a short length of stitch (such as 0.5) and a long width of stitch (such as 3.5). • With the postcard facing right side up, align the outer edge of the postcard so that it just touches the outer right position of the needle. Slowly work the zig zag stitch along the edges of the postcard, creating an overcast stitch edging. 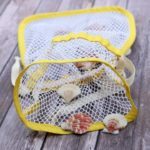 • If you’ve added the ornament hanging, be sure to move more slowly over the knots to cover them with the overcast stitch and to avoid tangling up the hanging in your machine. • Trim off excess pieces of thread. • If you plan to send the postcard in the mail, write “postcard” at the top of the back piece with a permanent or fabric marker. • Use the marker to write a vertical line down the center of the card. The recipient’s address will be written to the right of the line while your message will be written on the left of the line. • Place a stamp in the upper right corner of the postcard before mailing. Since your postcard may be too thick to be processed by a machine, additional charges may apply. For best results, use a first class mail (letter) stamp rather than a postcard stamp. That’s all from Underground Crafter! To celebrate National Sewing Month, we’re giving away a GRAND PRIZE: this BERNINA 215 Simply Red valued at $999! 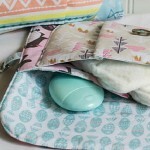 Enter to win on AllFreeSewing.com. Gain extra entries for our grand prize by commenting on our daily National Sewing Month blog posts here on Seams & Scissors. Comment your answer to our question below for an extra entry! Commenting on this page will enter you to win the prize. Duplicate comments will be deleted and are not tallied. 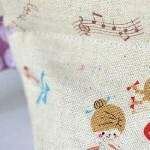 The winner will be selected at random from the comments on this page and entries on AllFreeSewing.com. You have until September 30th, 2016 at 11:59 CST to leave your comment on this post. Comments after that will not be counted. Contest is open to anyone 18+ in the US and Canada. Void in Puerto Rico, the Province of Quebec and where prohibited. The winner will be contacted by the e-mail address provided in their account. Today’s Question: Snowmen vs. Reindeer – Which do you like more? oh, geez! must I choose? Well, for my holiday greeting cards, I look first for deer, if none of the designs are to my taste (the more like Currier & Ives, the better), then I’ll look for snow people, snowy animals, snowy or “warm hearth” scenes. So, I guess deer win. re: postcard project. If the fusible is stiff enough, why is the card needed? couldn’t you write on the interfacing surface? Great idea to make postcards! My only worry is that someone along the way may like it so much, they’d keep it! Snowmen for me 100% of the time! We have a family snowman collection that goes up after Christmas and stays til Valentine’s Day. It’s gotten so large that we really need to start dividing them up within the family and share the love! Love the fabric postcard idea. A definite do project for mu scaps! Snowmen! I have snowmen out all year long..
Snowmen! They can be any size! Cute idea on the post cards !!!! Reindeer over snowmen !!! Snowmen are for me. I’ve been collecting them for over 30 years. I love this postcard idea. I would make all of mine with snowmen. Thanks! Well I’m wondering if the Embroidery Floss Hanging thread is allowed/can go through the mail? I LOVE this idea though! And not only a postcard with Holiday wishes, but also can be used as an ornament! Card & Gift all in one! I really like Snowmen since they can be most of winter season. Where Reindeer are more for Christmas time. (I LOVE both). I also live in Georgia were this isn’t enough snow to make a snowman. And sometimes you just wanna make a Snowman!!! If I were sending the post card through the mail, I would NOT put the hanging loop (thread) on it… or I might add the thread if I were going to mail the card in an envelope. What a decision-I guess I will choose snowmen even though I have seen some really cute reindeer! Always love snowmen! Thanks for the chance to win this month’s drawing! Santa Claus would be nice too. Hard to decide. I think I’ll go with Snowmen. I like both, but I think I like snowmen more. Thanks for offering this great giveaway! I love small projects. Snowmen are my choice too. Snowmen! I collect them. And I love the postcards, have made several. Ive sent many postcards thru the mail, as well as single pinecones, a bottle with a letter in it, a mini quilt, a ziplock bag and more. You can send just about anything thru the mail. People at my post office are always waiting to see what I will send next. My vote goes for reindeer! Love the snowman!! What isn’t more enchanting than a talking snowman?! If you’ve never experienced a white Christmas (especially with kiddos) there’s nothing better. Snowmen all the way! This is such a cute project. I like snowmen, at least when they are fresh and new. Here in Buffalo, we get a lot of snow. Growing up and living most of my life where it doesn’t snow, I’ve always felt left out of the snowman thing :). Of course, we have no reindeer here, but I would choose them over snowmen! Love them both and they are both perfect in their own way. Depending on what I am doing, one may be more perfect than the other. They both rock. Reindeer in December especially with a red nose and snowmen always melt my heart in January! Although I like white tail deer I prefer snowmen to reindeer. Such a cute idea! Reindeer. I love animals.